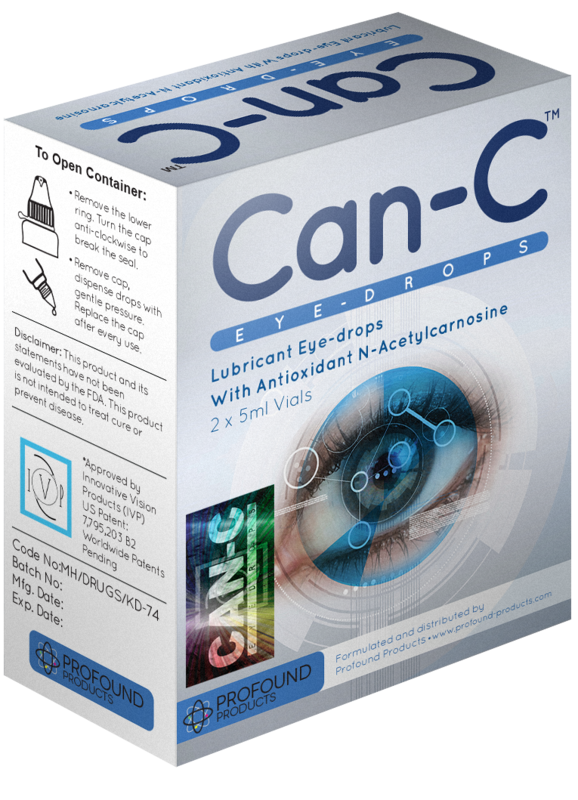 Why are Can-C™ eye-drops used? Where can I see before and after pictures of Can-C™ treated eyes? How does Can-C™ work in the eye? Where can I read published information about N-acetylcarnosine? What makes N-acetylcarnosine different from L-carnosine? How and when do I use Can-C™ eye-drops? What about side effects and contraindications? Where can I read Can-C™ eye drop testimonials? How do I store Can-C™? Where can I obtain Can-C™ eye-drops? Home What is Can-C™? Why are Can-C™ eye-drops used? Where can I see before and after pictures of Can-C™ treated eyes? How does Can-C™ work in the eye? What is in Can-C™? Where can I read published information about N-acetylcarnosine? What makes N-acetylcarnosine different from L-carnosine? How and when do I use Can-C™ eye-drops? What about side effects and contraindications? Where can I read Can-C™ eye drop testimonials? How do I store Can-C™? Where can I obtain Can-C™ eye-drops? Can-C™ eye-drops are the original brand. This website is designed to bring you accurate and correct information about carnosine (specifically n-acetylcarnosine) and how it can aid to support vision. Learn how the unique N-acetylcarnosine in Can-C eye-drops works, how it can improve failing eye-sight and why quality, efficacy and safety can only be guaranteed by the researchers of this technology.